In 2004, Sam Beam released what would become one of the most influential folk albums of the 21st century to date. That special album is Iron and Wine’s “Our Endless Numbered Days.” It features gritty primitive tracks like “Teeth in the Grass,” genuine and gentle acoustic numbers like “Sunset Soon Forgotten” and pleasant, reminiscent numbers like “Sodom, South Georgia.” All 12 songs on this album are in fact perfect in their own right. Any longtime Iron and Wine fan knows about “Our Endless Numbered Days.” It is how many of us were introduced to Sam Beam. What diehard Iron and Wine fans might not know is that recording “In the Reins,” the 2005 split/EP Beam did with Calexico, was one of the most influential experiences of his career. “To be honest, I probably learned more that year than I have in the previous 20 years of making music by myself,” Seam said in a phone interview with the High Plains Reader. “In the Reins” is a brilliant take on Americana music. Listeners get a fulfilling dose of cheerful horns lines, twang, mama-papa lyrics and wholesome melodies. It was essentially Beam’s transition point from DIY folk to untested folk. Before “In the Reins,” Beam’s music was mostly minimalistic and quiet – though extremely hearty. Today, it’s more textured, layered and abstract. We got our first dose of that with Iron and Wine’s 2007 album “The Shepherd’s Dog.” Beam introduced new instrumentation, a fuller sound and more experimental song structures. Still, as more of a somewhat abstract musician now, Beam remains highly intuitive and true to himself. It’s perhaps why his music is so captivating and memorable. That’s also how he approaches writing lyrics. Beam is extraordinarily poetic and broad-minded with words. Lines such as “the desert put a babbler in your ear” or “Jesus the Mexican boy, born in a truck on the Fourth of July” stir our curiosity, rouse our imagination and make room for newer, bigger ideas. Beam said he doesn’t usually try to interpret his lyrics. If he likes how a lyric sounds or flows, he keeps it and moves on. “It is interesting though cause as a working touring musician you end up having to revisit a lot of your old material and you can’t help but go, ‘Where did that come from?’ or ‘That’s interesting, that line,’” Beam said. Beam said the album is about a young couple, hence the cover art, which displays the two embracing. Though the viewer can only see them from their midsections. The interesting part about the cover is the contrast between the photo and the frame. Perhaps this idea came from his artsy film professor brain. He went to school for art and he specialized in painting. Then, before he became a full-time musician, he taught film and cinematography at the University of Miami and Miami International University of Art & Design. 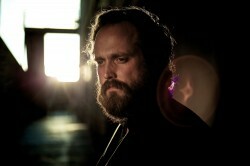 This Saturday will be Iron and Wine’s very first show in Fargo. And all 12 band members will be there.